I haven't had the best luck gardening this year. I got off to a promising start. I started my seeds back in March. I was oh-so-enthusiastic after not gardening for the past five years to get back into things. I set up my little trays and had 120 plants all ready to go in the ground before I left for California. While I was in California, Paul watered the plants for me. Each day I asked how it was going and he would say, "oh the plants in the side yard are okay, but the plants in the backyard aren't doing so great." That's odd, I thought. The backyard is full sun. The side yard is half sun (if that). I planted the plants in the side yard that were left over since I didn't have enough room in the backyard. Midway through the trip Paul said something about hoping half the plants would survive. What? I thought. In California pretty I'd had a close to 100% success rate... and my worries had been deer and jack rabbits and ground squirrels and bears who might take down the fence. And my sweet little heirloom seedlings had been thriving when I'd left. What in our little city patch of land could be killing my plants. The soil? I came home and found that around five plants were still alive. The others looked as if they'd been brutally murdered by something with sharp teeth and a passion for greens. I've been glaring at the squirrels for the past month. And then I looked out and saw this guy chilling in my garden having lunch? (On what? I might ask him, because while he's left 1 cilantro plant alone, everything else has been more or less destroyed). He turned around, saw me, and ran for... a small hole under our garage. 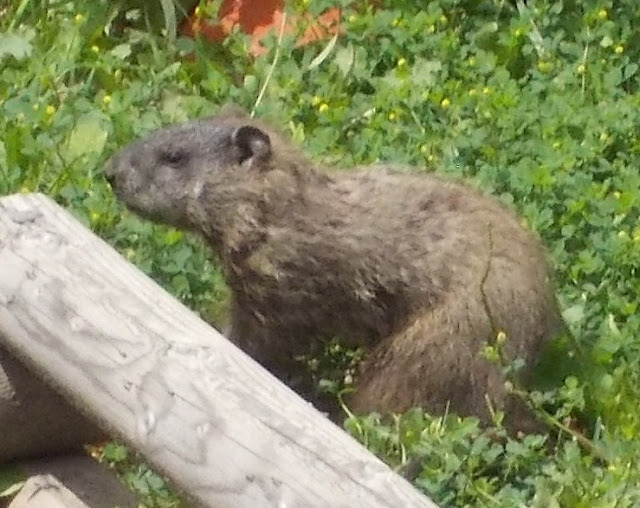 My first though was "marmot" only because I'd heard of marmots growing up but wasn't exactly sure what they looked like. My mom suggested a ground hog. 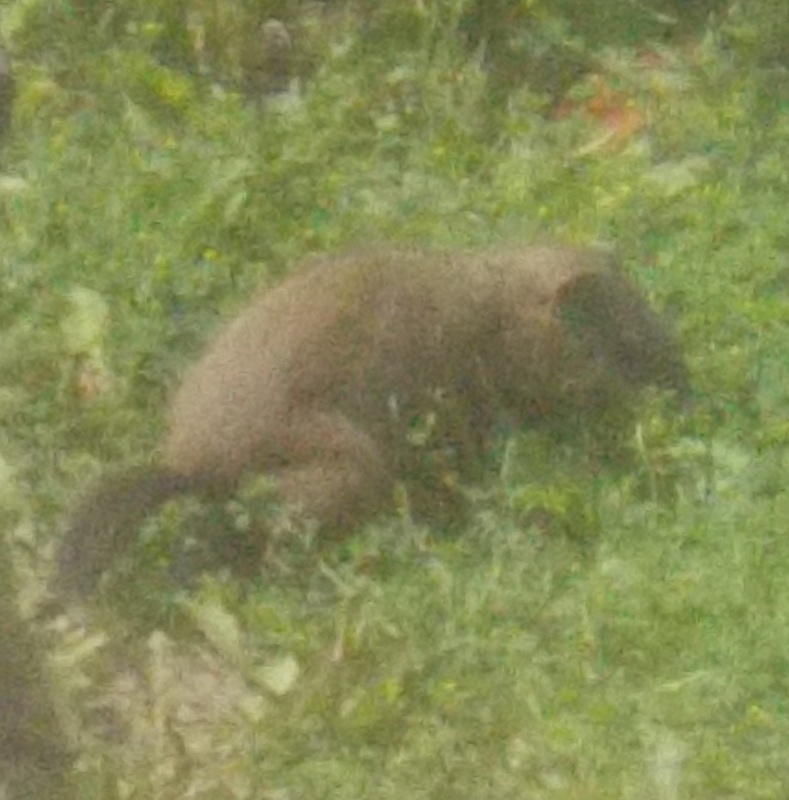 Facebook votes from the south came in with nutria and muskrat (I didn't post the tail picture since it was fuzzy). Then I found the Wikipedia page for Groundhogs (which includes marmots and woodchucks) and had the answer. This little guy is definitely a Whistle Pig (my favorite name for a woodchuck). So I'm walking around the house with the words "how much wood would a wood chuck chuck if a wood chuck could chuck wood?" going through my head. No wonder my garden was a flop this year. This not-so-little guy is using it as his own personal salad bowl. Can I admit now that I've caught myself trying to think of a name for our little Whistle Pig? Can you make a chicken wire fence for next year? kind of how you feel right now? It's how I feel but with birds.